Full Moon September 24th /25th is in the first degree of Aries, a very powerful point on the zodiac wheel. A Full Moon happens when the Sun and Moon are in opposite signs and is always a time when things come to a head, culminate or are shown to us… in techn-icolour. It can also be a time of great paradox, when we feel pulled in different directions. This one is more intense than most, due to both the luminaries, as well as Chiron and Mercury, being in a square to the teacher planet Saturn. This energy can be a little heavy, but rather than focusing on that that, I would like to explore what its asking of us and how we can grow, through working with it. For me, this full moon and the current planetary activity, particularly Saturn’s journey through Capricorn for the next 2 years, is urging us to build our integrity, or our Soul Stamina. On the day of the full moon, we have the Moon and Chiron (the wounded healer) in Aries, opposite the Sun and Mercury in Libra. The Sun and Mercury (the planet of thoughts, speech, communication) in Libra, urge us to co-operate, play nice, keep the balance, maintain the status quo exactly as it is. Libra is all about creating love, peace, harmony and beauty – “Let’s just shut up and keep the peace, Let’s all love one another” says Libra. Directly opposite to this, there’s the moon and Chiron in Aries, which urges us to be unique, independent, state our opinions, stand up for ourselves, assert ourselves, dare to be different, rock the status quo and to take the next leap forward in our lives. “We walk straight, so you’d better get out the way” says Aries. Can you feel that polarity? And then to take it up a few more notches, along comes Saturn, the somewhat stern teacher/ authority figure of the zodiac, who shows us our inner conflict or perhaps, our incongruities. As annoying as this archetype can be when he weighs in like this, it helps to remember that he is always urging us to see times of difficulty as learning opportunities. Over the next few weeks and months and years, we’re being encouraged to look at whether we are living our lives with integrity, which is when our our actions are congruent with our thoughts/words and beliefs. If not, there’s little chance that we can create a sense of inner harmony, which is the theme for this month. First identify two or three beliefs or truths that you hold sacred. These are things that you think or say often to yourself or others. Here’s one example. Let’s say you find yourself often saying “We are all connected. We are all one”. So… what do you actually believe? 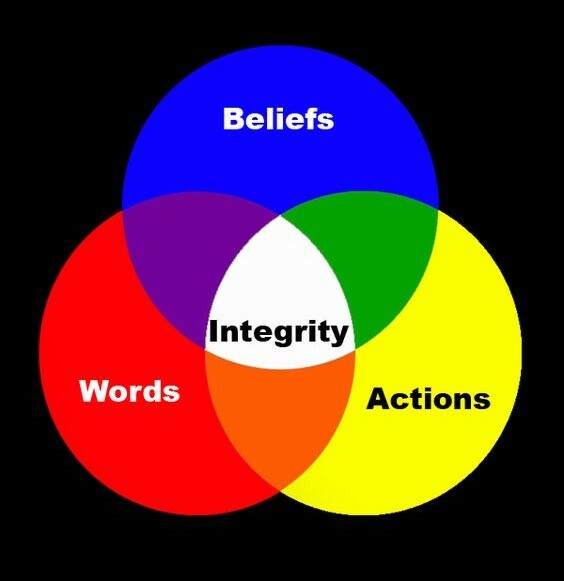 Are you in integrity when you make the blanket statement that we are all connected… all one? Chances are… this troublesome person or situation has appeared at exactly the right time to show you your incongruity, and… unless you’re enlightened, it’s possible that you experience this somewhere in your life! If it feels a little uncomfortable to read this, then Saturn is doing his thing, impeccably! Carolyn Myss suggests that when we behave in a way that is contrary to a higher truth that is functioning within our souls, we create a storm in our energy field. In that moment, we are at war with ourselves. She suggests that we develop soul stamina through acting congruently with our beliefs, one small step at a time, day by day. Investigate what you really believe to be true for you … now… today… it may have changed! Keep a watchful, but compassionate eye on your own actions and words. When you find yourself thinking, speaking or behaving in a way that is contrary to what you say you believe to be true, gently hold yourself accountable (Saturn) and reassess what you’re about to say or do. If you can’t change your behavior, go back and honestly reassess the belief. By doing this consciously, situation by situation, we build congruency, integrity, maturity and what Myss calls Soul Stamina. Whatever Saturn in Capricorn is travelling in your birth chart will be the main area where soul stamina needs to be built over the next 2 years Let me know if you would like to book a session to explore this. I still have some space on my next workshop in Gillits KZN. On this one day workshop we will explore what, in our lives, is ready to come into being and how we can put practical steps into place to bring it into the world! We will explore this artistically by creating an intuitive painting, using spring as our theme. FULL MOON / EQUINOX – 20/21 MARCH 2019 – Zero Point! NEW MOON, MERCURY RETROGRADE, URANUS MOVES!